I told you that you'd see this information again... It's that time of year again! 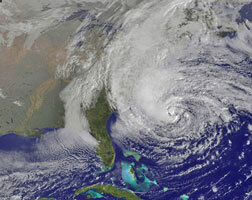 Welcome to the official start of the 2013 Hurricane Season, which will run through November 30th. We made it out of May without any tropical systems, but as I type up this newsletter, there are rumblings that something could form in the Gulf of Mexico in the next week or so that could make it a very wet weekend for the Sunshine State. This far out, it's hard to know all of the details, but this is the time of year that our ears should perk up when we hear mentions of a possible forming tropical system. This year, all of the forecasts, including the FSU-COAPS forecast produced by my colleagues, show that this will be a very active season for the Atlantic region. I've seen reports of anywhere from 13 to 20 storms. That number alone should have all of us feeling cautious, looking at our current hurricane supplies, evacuation routes, and plans, and making any final preparations for the season. What's that? You haven't prepared? Well, you're in luck!! It is important that you and your family have a hurricane kit and hurricane plan, so that if an impending hurricane threatens your area, you are ready to act. I was lucky enough to spend a week in May in Colorado, where I was able to visit CoCoRaHS Headquarters on the beautiful campus of Colorado State University. I was also treated to a driving tour of the area and saw one of the high water marks for the 1997 Fort Collins Flood, Nolan's famous farm, Horseshoe Reservoir and Big Thompson Canyon. The lack of humidity always amazes me when I go out West, and this year was no exception. I believe that every ounce of moisture was sucked out of my body the minute I deplaned. The real purpose of the trip was to create a plan for the future of CoCoRaHS and highlight some of the accomplishments, trials and things that didn't quite work during the previous year. The meeting focused on a few key topics: Quality Control, Education and Training, and Web/Database Design. In the next few months, we will be asking the observers to give feedback on a new website and tools that are in the final stages of development. There is a lot in store for the future of the program and so many things we want to do. The dedication you all put into making the observations and being a part of CoCoRaHS is the reason we are able to look down the road and make long-term plans. 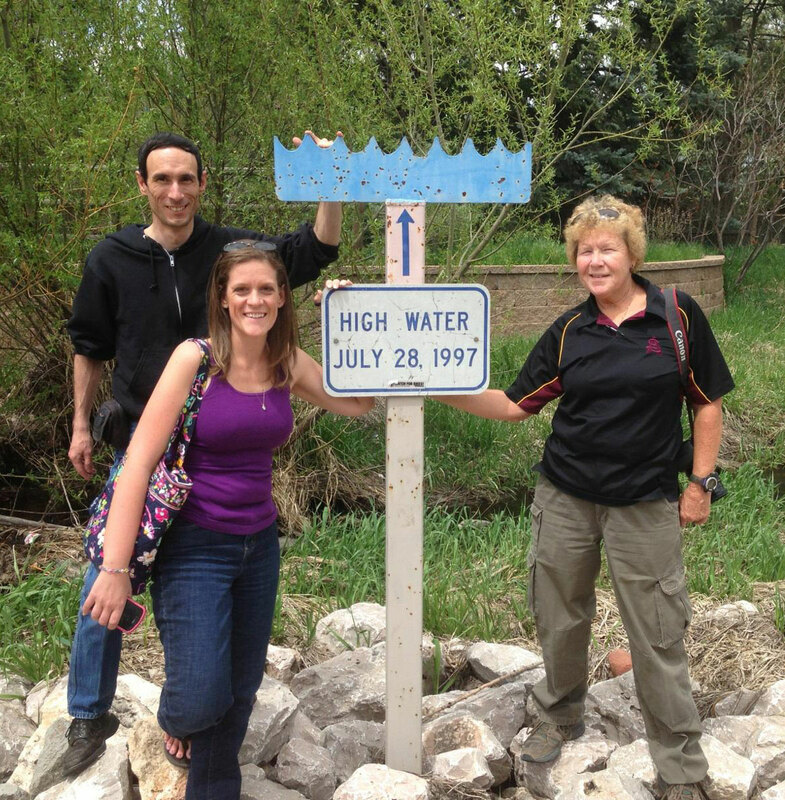 CoCoRaHS coordinators Tony (WY), Melissa (FL), and Nancy (AZ) at a high water mark for the 1997 Fort Collins, Colorado, flood. Rainfall totals across the state varied in May (Table 2). 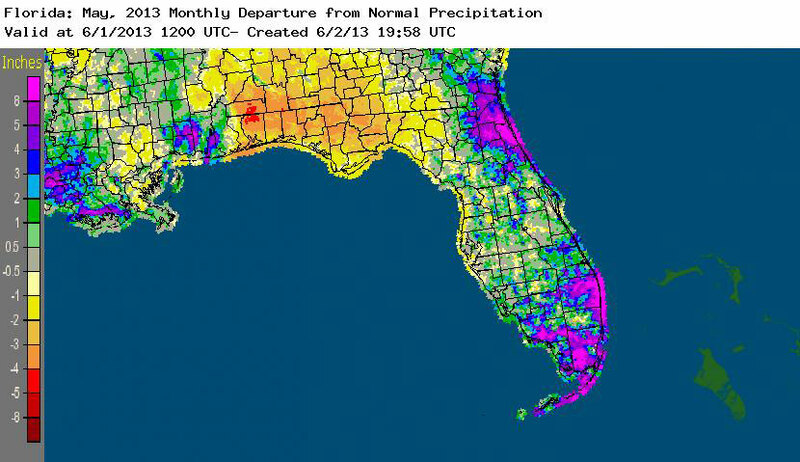 Portions of northeast and south Florida, along with localized places in the interior of the peninsula, recorded above normal rainfall (up to and over 8 inches), while the Panhandle and Big Bend regions had 2 to 5 inches below normal precipitation (Figure 1). 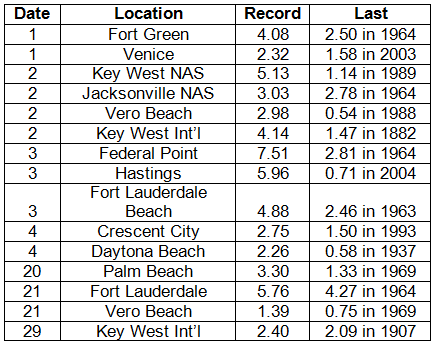 May was the 6th wettest on record at Fort Lauderdale (Appendix 1) and 7th wettest at Key West, while it was the 4th driest at Tallahassee and the 13th driest May on record at Pensacola. There were a few precipitation records broken during the month (Table 3), with one of those records dating back to 1882. Despite the excessive rainfall that eased drought in some areas, the spring dry season led to a re-introduction of drought classifications along the Panhandle. Table 1: May precipitation totals and departures from normal (inches) for select cities. Table 2. 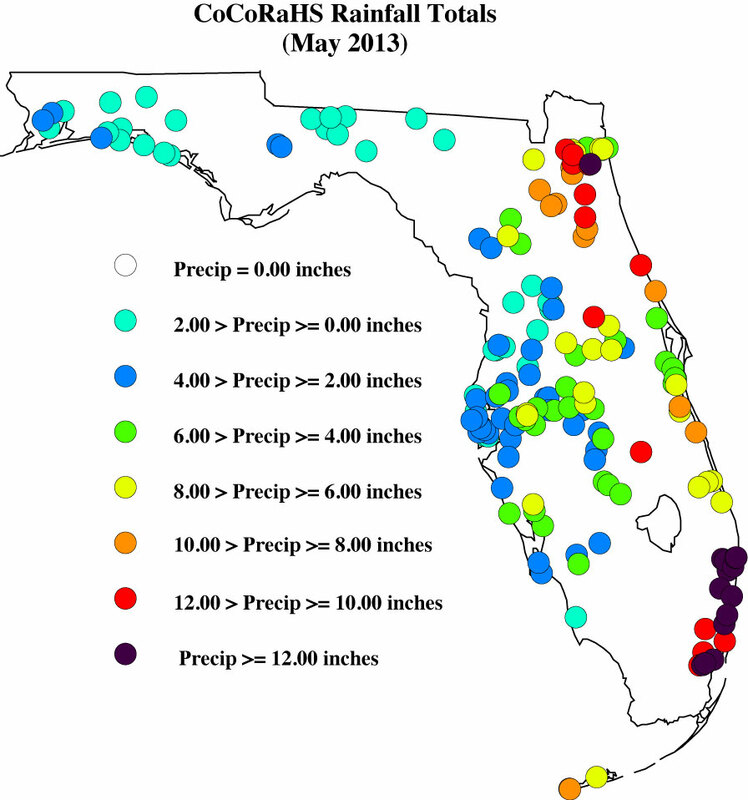 Select daily rainfall records (inches) broken during May (compiled from NOAA, NWS). 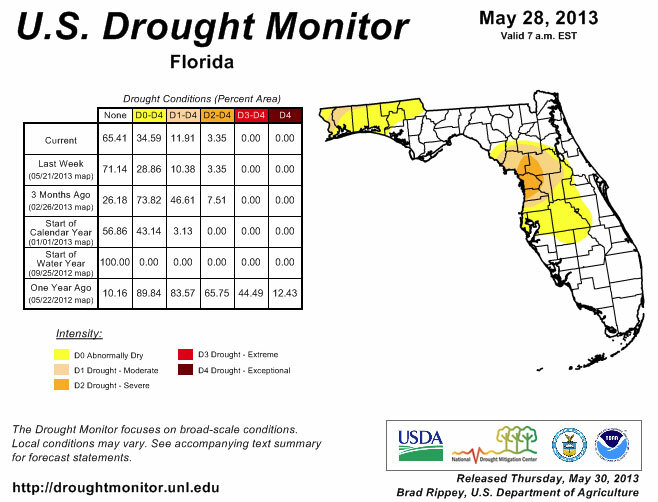 At the beginning of May, the peninsula was under drought classifications that ranged from abnormally dry (D0) to severe drought (D2), with the worst part of the dryness in portions of Citrus, Sumter, Lake, Marion, Levy, and Putnam counties. May is typically one of the driest months across the entire state, with the statewide precipitation average of 3.86" for the month (based on 1895-2012). Widespread rains in the northeastern counties and along the east coast during the first part of the month helped ease drought conditions in most of the area where drought had been lingering since the beginning of the year. Rain continued to fall over most of the same area during the remainder of the month, while the Panhandle and Big Bend regions remained dry. By the end of the month, the lack of rainfall in the northern part of the state prompted the re-introduction of dry conditions to Escambia, Santa Rosa, Okaloosa, Walton, Washington, Holmes and Jackson counties. A few reports in Florida were flagged and required some additional information during May. I appreciate how understanding the contacted observers were, along with how quick they were to reply to my emails, though there are a few outstanding issues that need to be resolved. Please remember: if you receive an email from me with the subject line 'Question About Your Recent CoCoRaHS Observation', please take a moment to answer me back. And if you have any questions, please feel free to contact me.